Youtube is on a mission! And that is to make your life – your average, everyday livelihood – into a global documentary that will broadcast exclusively on Youtube. 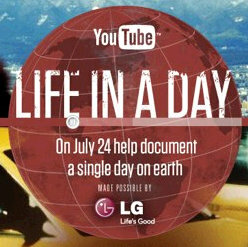 The project is called Life In A Day, and on July 24, you have 24 hours to capture a glimpse of your life on camera. The most compelling and distinctive footage will be edited into an experimental documentary film, executive produced by Ridley Scott and directed by Kevin. The way it works is this – take a video of your day on July 24th, submit it to Youtube. I’m assuming that in conjunction with Youtube, the director is able to isolate the videos submitted that day for the purpose the film. Or, you should probably tag your video with “life in a day” – or even use “life in a day” in your title. The film will premier at the Sundance Film Festival in January 2011 and will also be shown exclusively on Youtube at https://www.youtube.com/lifeinaday.